This is the new viper. More polygons, longer, headlights, bubble canopy. New light mg turret and muzzle. Asymmetry is fun! New twin mg turret and muzzle. Aww, back to symmetry. New LIGHT left vtol wing. No good textures. Oh, well. Also did the FX for it, but it's not worth taking a picture of. Well, just tell me what you think. I'm working on the heavy MG as we speak. It's good to be modding...and if you can tell me how to get it into the campaign, that would be nice. I basically keep getting a message telling me that the application has requested to be terminated in an unusual way. So, you know, if that helps. error: IMD load failed - trlmg1.pie"
Last edited by Computerboy319 on 31 Mar 2007, 07:32, edited 1 time in total. 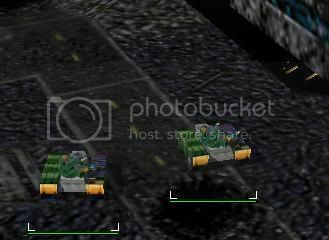 warzone textures are ok when running in low resolution like 640x480,but it will look very crappy when the texture is 'stretched' in higher resolution 1024x768+,maybe it's because the old textures are not designed for high resolution and warzone's superzoom aggravates the problem. But that's the thing, I'm using the default texpages that came with PIE Slicer. I haven't created any new ones or anything. 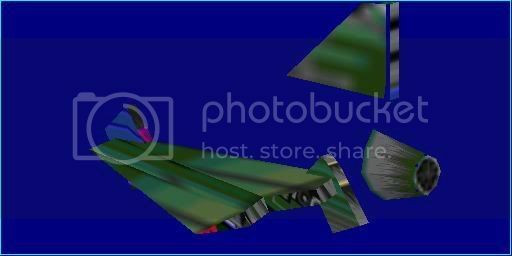 EDIT: Perhaps this might have something to do with the fact that my PIE Slicer can't open the pie files in warzone.wz? 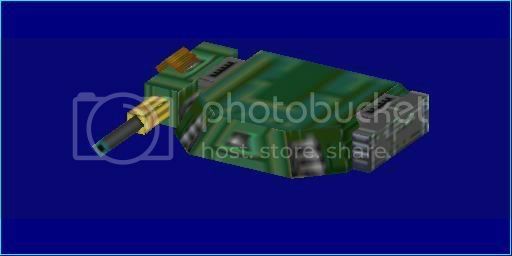 I've been modifying the files from Vanilla Warzone.wdg and using those. Last edited by Computerboy319 on 31 Mar 2007, 07:58, edited 1 time in total. Computerboy319 wrote: But that's the thing, I'm using the default texpages that came with PIE Slicer. I haven't created any new ones or anything. and save,then put them into corresponding folders. 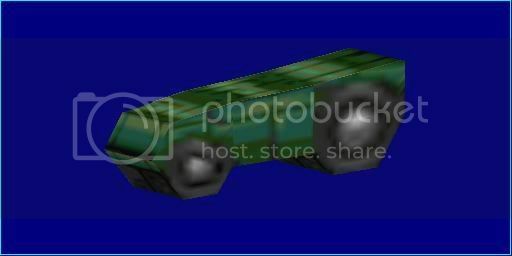 to use old pcx textures you will need to convert them into png with tool. Well, that got them working and in-game. 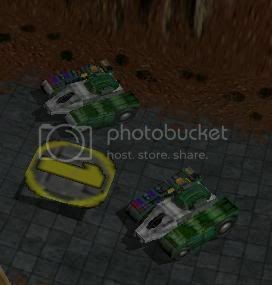 They're just fine, but unfortunately, the turrets are kind of small to see and the anti-aliasing just makes it worse. Here's an in-game shot (I didn't finish assigning textures to the right wheels,) I'm off to bed and tomorrow I'm going to make bigger turrets. If there's a particular favorite weapon someone wants re-modelled, I can take a special request while I work my way through the order you find stuff in the campaign...I've currently got flamers, heavy MGs, and sensors qued up. I might take a break sometime to do buildings, but I really haven't made any drawings of what I think they should look like. Last edited by Computerboy319 on 01 Apr 2007, 05:24, edited 1 time in total. Well actually there is no anti-aliasing, so it really is the aliasing that makes it worse. Computerboy319 wrote: Well, that got them working and in-game. 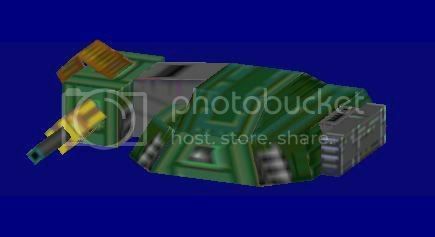 They're just fine, but unfortunately, the turrets are kind of small to see and the anti-aliasing just makes it worse. Here's an in-game shot (I didn't finish assigning textures to the right wheels,) I'm off to bed and tomorrow I'm going to make bigger turrets. good work on the mg's... i'd tried for a long time to get nice looking mg's, but always failed. i agree with watermelon that it'd be nice if they were small, but i also agree with computeboy that they're probably to small to visually identify at normal zoom levels in combat. btw, since you're working on this, i've got my old high-poly propulsion mod posted somewhere on these forums: if you think any of them are useful to you, you're more than welcome to modify and use them at will (subject to terms of gpl). Re-did those MGs to make them a little easier to see in combat, and just to make them not look ridiculously small...re-did the muzzle flashes and tracers on the twin MG, though it's just a matter of re-locating them, real improvment will come later. 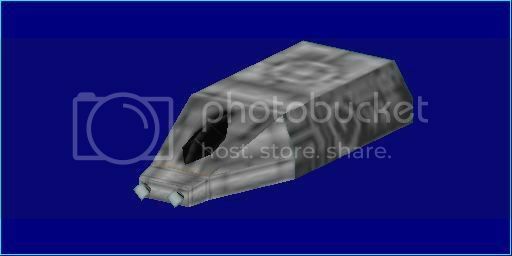 As far as textures, I do agree texturing is where the biggest improvments can be seen, but as far as I know it, PIE Slicer coding supports...I guess 99 texture pages? 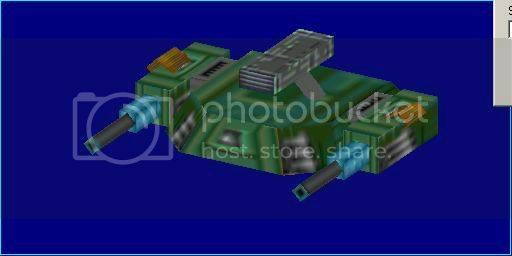 Who says we can't have one texture page serve, say, all the Project bodies, another do NP bodies, another do all the cannon variants, etc. That gives us much more room to have better textures. So, we might not have something with a 256x256 texture...but 100x100 is better than 10x8, isn't it? cegrocks is going to either learn how to do textures himself or find someone at school who will. that's the main reason my propulsion models (for the ground-based propulsion) looks really odd -- they look nice when a vehicle is sitting still, but the "floating" effect is *much* more pronounced when they're moving, because of the added detail. suffice it to say, if you guys add some way to cycle specific anims based on the action being performed (forward, backward, perhaps running anims for side of the prop that's on the "inside" of a turn slower than the other to give an accurate effect), then i can finally finish that mod. Computerboy319 wrote: Re-did those MGs to make them a little easier to see in combat, and just to make them not look ridiculously small...re-did the muzzle flashes and tracers on the twin MG, though it's just a matter of re-locating them, real improvment will come later. It would cool if cegrocks can find someone with good texturing skills or he can do them himself,since we dont have anyone working on the textures as far as I know.The 'snake bodies' need sort of snakeskin texture to make them more unique imo. using the velocity of a droid to determine whether to play 'move animation' or 'still animation' should be feasible,but I dont know how pie animation works,seems it's a multi-pie file like Computerboy said and it cannot be played/created with pie slicer it seems. Watermelon wrote: The limits of texture page is 64 in source iirc,though you can change it to any number with very few changes in source files.The pieslicer limits require someone with extensive vb knowledge to modify the pieslicer source and recompile,but we dont have a decent vb programmer atm methinks...using the velocity of a droid to determine whether to play 'move animation' or 'still animation' should be feasible,but I dont know how pie animation works,seems it's a multi-pie file like Computerboy said and it cannot be played/created with pie slicer it seems. i (or any other oldschool wz modeler) can tell you all about pie animation... just tell me what you want to know. atm, we *could* rig up a few anims for that using the existing pie anim format, assuming there are a few source changes to play the right anim at the right time, but i promise you it wouldn't be pretty. the best and cleanest way, by far, is to look into the code that makes the vtol "jet" gfx work while in flight (uses the "team colors" texture coords as the frames for the texture anim), and extend that to the ground propulsion types. 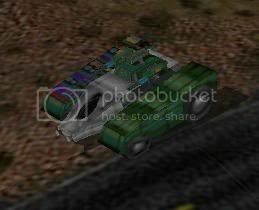 since vehicles, iirc, don't move in reverse in warzone, then we really only need to replicate the code as used for the vtol jet gfx and it should work. later on, variable playback (turning) and reverse playback (going backwards) on the same anims would be nice.